Welcome to another December-themed Top Ten Things, here at Enuffa.com! Today I'll be talking about my ten favorite December PPV matches. Aside from WCW's Starrcade, December has generally been a month for B-level PPVs and few Match of the Year candidates. But there have most definitely been exceptions, both from WWE and other promotions. One match I really would've liked to include in this list is Ric Flair & Barry Windham vs. The Midnight Express from Clash of the Champions IV. But that wasn't a PPV, it was a special TV event, so I had to leave it out. Anyway, here's my top ten December PPV matches of all time. The first of the WWF/WCW Title Unification semi-final bouts, this pitted WWF Champ Austin against arch-nemesis Kurt Angle, in a repeat of their SummerSlam and Unforgiven 2001 battles. This time though, Austin was back to being the top babyface and Angle was the heel. There wasn't anything fancy about this, it was just an excellently-worked old-school wrestling match. While not at the level of their amazing SummerSlam bout, Austin and Angle nontheless put on a helluva show, culminating in Austin reversing a Stunner attempt and countering with his own to retain the strap and advance to the Finals. CM Punk's first PPV defense in his 434-day WWE Title run may have been against two less-than-threatening opponents (Miz especially was coming off a two-month burial), but that didn't take away from this exciting TLC match. All three men worked hard to make this innovative and unpredictable. Punk was handcuffed to a ladder and later to one of the turnbuckles, creating suspense about how he'd get out of this one with his Title intact. Punk got to play the role of "smart babyface" (which sadly doesn't happen often) and after unscrewing one of the ring ropes, he GTSed Miz on his way to victory. During the Smackdown Six Era, the two most accomplished former Radicalz met at Armageddon in a no-frills, old-fashioned wrestling match that stole the show. Benoit and Guerrero had wrestled each other dozens of times in the past, and this fit right into their considerable catalog. While slightly marred by Chavo's unsuccessful interference attempts and a couple of early miscues, this was still a fine bout with a suspenseful submission finish. This wild carnage-filled brawl was the in-ring debut of The Shield, and it completely stole the show. All six participants took some insane punishment, and the action never slowed throughout the bout's 23 minutes. This match helped cement The Shield as bona fide future stars and also kept the babyfaces looking valiant. The Shield incapacitated Kane under a pile of ringside rubble and worked over Daniel Bryan and Ryback, leading to their first of many wins. One of the craziest TLC matches in recent years. The main event of the Smackdown-only TLC show pitted WWE's current tentpole wrestler AJ Styles against the maniacal Dean Ambrose in one of the wildest TLC matches in recent memory. Ambrose dominated the first half of the bout, beating Styles all around the arena and putting him through multiple tables. 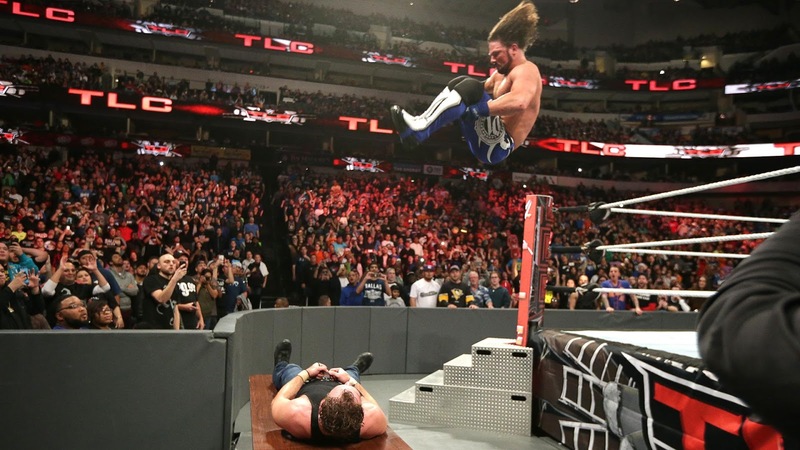 Despite having an unfortunately placed hole ripped in his tights, Styles mounted a comeback that climaxed with a death-defying, gasp-inducing 450 splash on Ambrose from the top rope to the floor, through a table! AJ eventually won this violent melee with the unexpected help of "ugly duckling" character James Ellsworth, adding another spectacular match to his already massive resume. 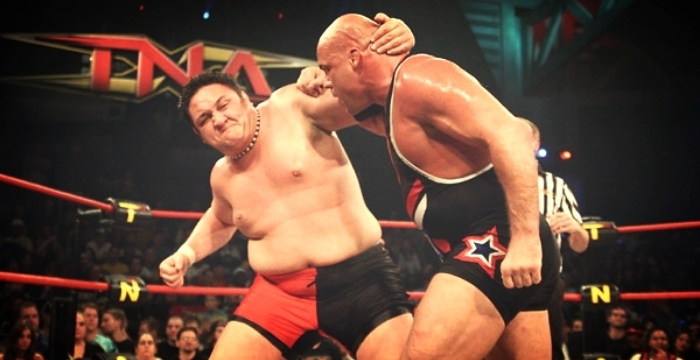 Samoa Joe vs. Kurt Angle was easily the greatest (and most profitable) feud in TNA history, and this was their best match together. Only weeks after his TNA debut, Angle won their shockingly brief first encounter at Genesis, but now it was time for Joe to even the score. After 19 minutes of spectacular back-and-forth chain wrestling and submissions, Joe finally made Angle tap out to the Coquina Clutch, ending one of the best matches of 2006. These two natural rivals had their third WCW Title clash of 2001 at Vengeance, in the second semi-final match to determine an Undisputed Champion. This bout was just as good as their vaunted No Mercy match, but with the added wrinkle of Jericho being a full-blown heel. The fast-paced action was back-and-forth, and Jericho would attempt to use both of Rock's finishing moves. After an unsuccessful Vince McMahon run-in, Jericho hit a low blow and took The Great One down with a Rock Bottom to capture the WCW Title. Jericho would of course go on to defeat Austin and unify the belts, becoming the first Undisputed Champion in nearly a century. While not the official main event of Starrcade '92, the finals of the King of Cable Tournament was nonetheless the most memorable match. This was all kinds of awesome - stiff, snug and believable all the way through. Vader's size and dominant style would realistically make most of his matches into rather unwieldy squashes, but Sting was so freakishly strong he was able to manhandle Vader for much of the match. This resulted in some amazing spots, like the second-rope superplex, Sting's over-the-top plancha on both Vader and Harley Race, and the finish where Vader dove off the top rope and Sting caught him midair and slammed him to the mat. Just a great main event (probably the best Starrcade match of all time), and I could watch these two beat the hell out of each other all day long. At the fifth In Your House event these two brothers-in-law actually topped (IMO) their all-time classic SummerSlam match with a gritty showdown that mixed graceful mat wrestling with blood-soaked drama. Bret bladed about halfway through and gushed all over the ringside area, which provided an additional sense of danger. The story going in was that Bret had never beaten Davey before one-on-one, and the recently heel-turned Bulldog was hell-bent on capturing Bret's WWF Title. After 21 minutes of spectacular action Bret rolled Davey up in a Magistral cradle (which I'd never seen before) for a surprise win. One of my favorite Bret Hart matches ever. There have been more action-packed matches, more brutal brawls, more epic contests. But in December 2005 Samoa Joe and AJ Styles told a story between the ropes that has seldom been equaled before or since. Joe arrived in TNA that summer and was immediately pushed as an unstoppable monster, who had his way with basically everyone in the X-Division. AJ was the superbly skilled conquering hero; the last line of defense against Joe's reign of terror. The pace started out methodical but escalated continously throughout the match. Joe dominated AJ with his brutal moveset, but the defiant Styles refused to back down, eventually kicking out of Joe's pin attempts at the one-count just to stick it to the villain. Blood pouring out of his mouth, Styles managed to lift the 280-pounder up for the Styles Clash, and despite diminished height the move still looked absolutely vicious. Joe kicked out however, and finished AJ with the rear naked choke, capping off one of the best examples of pure in-ring storytelling I've ever seen. Those are my picks for the ten best PPV matches of the holiday season. Got any of your own? Comment below, and thanks for reading! 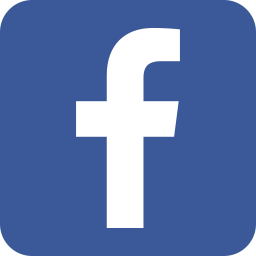 Join us on Facebook, Twitter, and YouTube!